The National Intelligence Council Forecast Megatrends (see http://www.defense.gov/News/NewsArticle.aspx?ID=118766). Once upon a time the US was considered to be too focused on quarterly results to have the wherewithal to perform ‘basic research’. That research which doesn’t lead to immediate results. Perhaps we in PSYOP need to take a moment and consider a couple of the Mega trends that were noted in the above December 11, 2012 article. The council believes that there will be a significant decrease in global poverty with a corresponding increase in the middle class. Normally considered good news, this could prove to be very fertile ground for terrorists to recruit those who either didn’t make it into the middle class, or who feel guilty or unhappy about being there and may be susceptible to fundamentalist recruiting. The world would no longer be dominated by the US economy but by China, Brazil and India with other contenders such as Indonesia, Colombia, South Africa and Turkey find their comparative fortunes increasing. This is very likely to mean that MISO will be conducted in new and potentially different places such as South America, Africa and South East Asia. In addition the report pointed out that demand for food, water and energy will grow significantly as climate change accelerates “amplifying existing weather patterns.”. There are no drives more basic than shelter, food and water. When citizens cannot get what they feel they need, there is frustration with the government and where there is frustration there can soon be conflict. As we look forward to 2013, let’s pause a moment and remember those who are no longer able to be with us and give special thanks for families, comrades and friends. The very best to all of you for the holidays and for the New Year. I know that my readers have nothing better to do than read manuals when they are hot off the PDF press. The November 2012 version of JP 3-13 Information Operations (IO) can be found at: http://www.dtic.mil/doctrine/new_pubs/jp3_13.pdf (which is also the picture source). Having just wrapped up a two week stint as the IO SME for an exercise, IO is still top of mind for me. I learned or relearned a number of things last week – first of all the IO or J-39 needs to be more of a band leader or camp counselor than other staff officers. Even though technically the “39” is the CDR’s IO self, that doesn’t always seem the case because each of the major players feels that they are an entity to themselves. This means the IO needs to be a catalyst to bring about the best mix for the CDR. The IO tools are never fixed. One AO demands TV while another can hardly read. In others Key Leaders (with Key Leader Engagement emerging as yet another discipline) are best reached via Internet kiosks and smart phones. Which brings me to the only constant regardless of AO – the mobile phone. It appears that no matter where you go, whether urban or rural, developed or not, the cell phone is an important if not the most import means of communication – the way people get or give information. To be effective the IO needs to know how to use mobile phones as a medium, but also how to deny individuals the use of their phones at certain times or perhaps to alter the messages they receive. For those of you that would rather watch football (or soccer) than read DoD Manuals, here are some of the more significant changes from the 13 Feb 2006 version. The order is not mine, but taken directly from the publication. Clearly this is not in order of importance. Identifies the information environment as the aggregate of individuals, organizations, and systems that collect, process, disseminate or act on information. Defines information-related capabilities (IRCs) as tools, techniques or activities employed within a dimension of the information environment, which can be used to achieve a specific end(s). Introduces the information-influence relational framework as a model illustrating the use of means and ways, through the applications of IRCs, to achieve an end(s) through influence of a target audience (TA). Describes information operations (IO) as the integrated employment, during military operations, of IRCs in concert with other lines of operation, to influence, disrupt, corrupt, or usurp the decision making of adversaries and potential adversaries while protecting our own. IRCs to achieve national or combatant commander objectives against adversaries or potential adversaries. Emphasizes IO must be integrated into all steps of the joint operation planning process. Articulates that it is vital to integrate multinational partners into joint IO planning, in order to gain agreement on an integrated and achievable IO strategy. As always reader comments appreciated and Happy Holidays. Yesterday, 6 December 2012, USA’s website (but not today’s printed edition) touted an article: “Special Operations Command leads propaganda fight” (see: http://www.usatoday.com/story/news/world/2012/12/06/socom-leads-propaganda-fight/1746013/) in which they have apparently woken up to the fact that MISO personnel (on the active side only of course) are part of SOCOM and that these professionals are deployed around the world supporting US government missions. The article points out that the SOCOM efforts include the virtual world and that some of the supported media do not carry US DOD attribution. 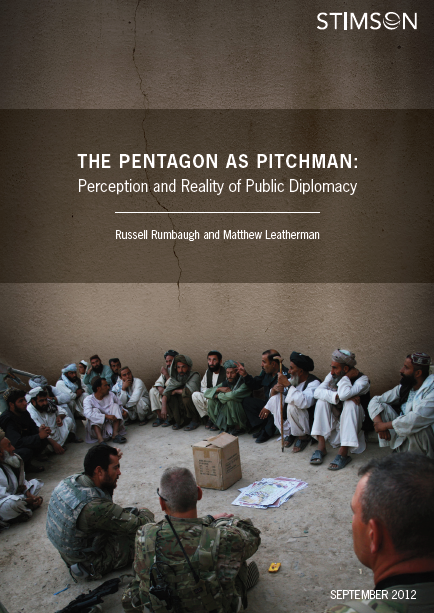 The article is based on a September 2012 report by the Stimson Center and can be found at: http://www.stimson.org/books-reports/the-pentagon-as-pitchman-perception-and-reality-of-public-diplomacy/ which is also the photo source of the report’s cover. “Most of the defense activities often implicated in public diplomacy should not be. From a Regimental Perspective – this article, like the one I profiled last time evokes negative images. In many ways it reeks of some poor journalistic techniques by selling newspapers through headline innuendo. Our Constitution goes a long way to making sure that the press can do all of this, but we, as professionals, have an equal or perhaps greater duty of setting the record straight. The challenge remains: how does the Regiment counteract this type of article? My best guess is that the soon to be announced Regimental Association needs to have a Public Affairs Committee and authorized spokes persons who can talk on behalf of the Association and by implication the Regiment. We also need to think about a systematic information stream to Congress so that the staffers who may not be familiar with defense issues can turn to an articulate and authoritative source. 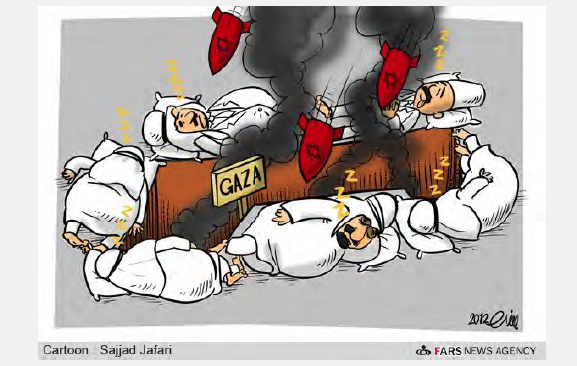 The conflict in Gaza is only the latest in the what seems like eternal struggles going on the Middle East. While this conflict may involve comparatively new political and national (depending on your point of view) entities, it has evolved over a very long period of time so that the current generation is far removed from the original events. There can be no question that the conflict is between Israel, a Jewish state and Islamic forces. While components of these two protagonists may run the gamut from orthodox and fundamentalist to moderate and reform, and there may be other religions involved, the two principal players are clear. Much of the media and PSYOP (for my doctrinal purist friends since much of the conflict is being pursued by non-state actors, they cannot have military forces since military organizations are arms of the state) is not directed locally but internationally and is designed to influence audiences far beyond the conflict. Social media is playing a prominent role in the conflict and there can be no doubt that there is an intended psychological effect behind the cyber attacks that have taken place. Much like the situation between the Koreas, there is no clear winner and no ‘legal’ resolve to the issues behind the conflict. While a cease fire may have been called and lower levels of outright conflict may exist temporarily, the final battle or agreement in this conflict is not likely to happen in the near time. 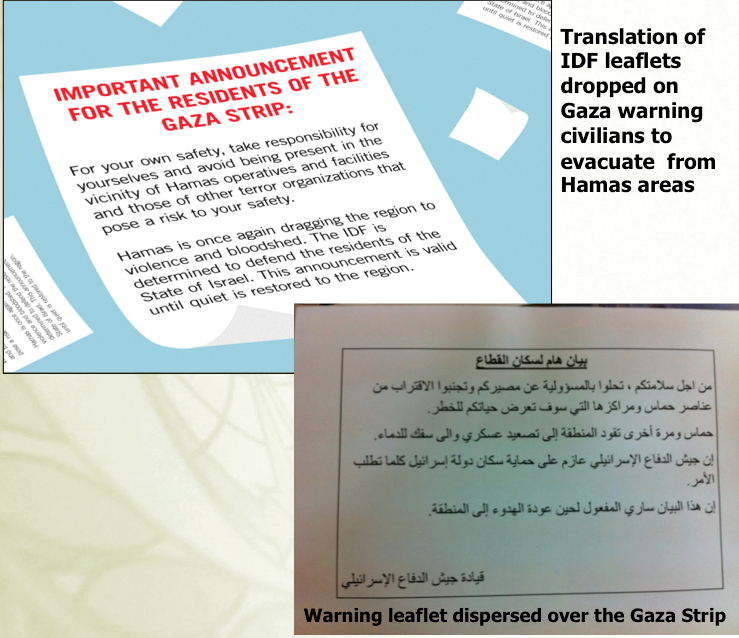 Today’s Gaza situation shows the importance of being able to adapt and innovate to dominate the war of today. It also shows that while there may have been considerable kinetic action, the real victory will come through influence. This being Thanksgiving week here in the US I was worrying that I would not be inspired enough to make my more or less weekly Blog posting, but thanks to USA Today – I was wrong. This article like many other USA Today articles in the past focuses on US “propaganda” and the contractors that provide services to the government. This time the center of attention is the Boston based Rendon Group and its founder, John Rendon. According to the article, “Since 2000, the military has paid the Rendon Group more than $100 million to help shape its communications strategy, analyze media coverage, run its propaganda programs and develop counter-narcotics efforts around the world”. I’ve heard John Rendon speak and he is indeed someone who knows marketing and his company has provided the government with a lot of services over the years, chiefly in Latin America as I understand it. What’s interesting about the article? 1. How is the article positioned to attract readers? The article screams “propaganda” which is always a red flag and a universally negative word. It leads with the fact that allegedly Rendon’s company once “weeded out reporters who wrote negative stories in Afghanistan and helped the military deceive the enemy in Iraq”. As to deceiving the enemy – are you kidding me? That’s the right thing to do, as for weeding out reporters, apparently the reporter has never worked in Commercial companies where public relations people do this all the time. Is there something inherently wrong in outsourcing tasks? Inherently any organization should be free to work with vendors who it feels can help the organization. As the war in Afghanistan winds down anyone who thinks that ‘green suiters’ aren’t going to be replaced by contractors to some extent should look for a really cheap bridge in Brooklyn. Former Chairman of the Joint Chiefs of Staff, Admiral Mullen’s quote from a year old interview was injected into the article “"I really do not like the term at all. It confuses people," Mullen said. "It means all things to all people. It's way overused and way overrated. I literally try never to use the term. We communicate as much if not more by our actions. I have become particularly concerned at a time that resources are so precious. It has become a thing unto itself. It is taking resources from the fight, I don't have time for it." I think he was right and that USA Today was trying to imply that these contracts are a waste of time and money. In short – PSYOP work is put under yet another grey cloud. Members of Congress who are scurrying about looking for ways to save money who read the article are apt to go on a PSYOP/MISO cost cutting witch hunt – yet again. The need for systematic and aggressive education for the public and Members of Congress seems to escalate any day. Hopefully, the nascent Regimental Association will consider this challenge as a part of their charter. However, serving military need to tread with care if they intend to work with Congress as there are legal and career implications. Let us all take a moment and give thanks for what we have and our ability to enjoy it in peace. Peace that has often come at a high price to those who serve. To those of you serving today – my thanks and I salute YOU! One of our readers has brought to my attention an article from the Army Times, “US military behind Africa news websites” (see http://www.armytimes.com/news/2012/11/ap-us-military-behind-africa-news-websites-111312/). The article addresses the US run web sites and there is a healthy dialogue about the effectiveness of these operations.